UPDATED ON FEB. 7: The community meeting in Almaden on February 11 will start at 7 p.m. It was previously noted as 6 p.m. In this post, we’ll address why service changes in Almaden are being proposed and how the community can share their feedback with VTA. 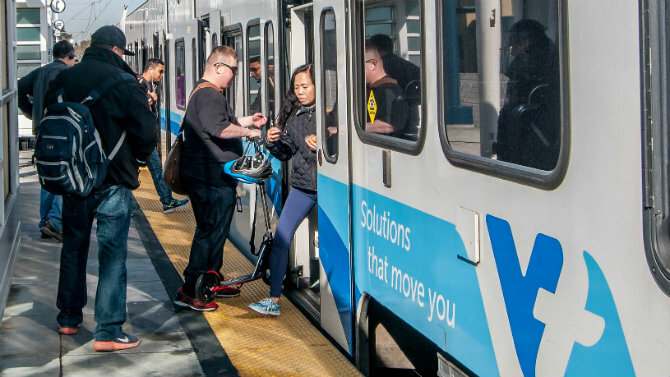 The draft 2019 New Transit Service Plan, currently in the public input phase, is in response to VTA Board direction to lower costs, increase ridership and maximize cost-effectiveness. As part of the draft plan, VTA is proposing substantial service changes to transit service in the Almaden area of San Jose. These proposals are among nearly 70 changes being considered to address VTA’s structural deficit and to ensure transportation sustainability in Santa Clara County. Compared to other parts of the county, Almaden is a suburban low-density community that is designed to be more auto-oriented. This leads to less transit demand resulting in low boardings compared to other VTA routes. The proposed changes are based on two major metrics: boardings per total hour and cost per rider. Routes 13, 328 and 330 that serve Almaden do not meet VTA’s minimum standard of 15 boardings per hour of service. Total hours include the time bus and light rail spend in revenue service and moving to and from the yard to a designated route. This also includes time spent deadheading (driving back to the start of the route for a directional trip with no riders onboard). The Almaden Light Rail Line that serves three stations - Ohlone/Chynoweth, Oakridge and Almaden - averages about 40 boardings per hour on weekdays. This falls below our standard of 60 boardings per hour on weekdays and is the lowest boarding per hour of our three light rail routes. The high cost of operating an hour of light rail service makes the cost per rider 68 percent higher than VTA’s system-wide average. Staff is proposing that this light rail line be replaced by a new bus route - Route 80 - that would serve at a 30-minute frequency and at an hourly cost of about one-third of light rail. At about 11 boardings per hour and $15.70 cost per rider, this bus route carries less than half the riders of an average VTA route and costs about 85 percent more per rider. Limited 328 operates two northbound trips on weekday mornings and two southbound trips on weekday evenings between Almaden Expressway & Via Valiente – Lockheed Martin/Moffett Park. Limited 328 spends about 40 percent of the time in revenue service. In comparison, most routes spend about 90 percent of the time in revenue service. The inefficiency of directional, commute-period only services drives the cost per rider on those services up considerably. Similar to Limited 328, the low ridership, high cost per rider and 37 percent of time spent out of revenue service makes this route a potential candidate to be discontinued. Route 63 ends at Almaden Expressway and Camden. In the draft 2019 New Transit Service Plan, Route 63 would be shortened to end at Blossom Hill, and Route 64 would be extended to Almaden Expressway and Camden. This change allows for one less bus on Route 63 and extends Route 64 without the need for an additional bus. VTA is now seeking public input on the draft 2019 New Transit Service Plan. Your input—specifically how the proposed 2019 New Transit Service Plan might affect your travel options—is important to us and helps us understand the impact. We encourage you to visit the website to learn more about the plan and the engagement process, and to provide your comments, questions, and feedback. The public is also encouraged to attend a community meeting or invite VTA staff to meet with your organization or neighborhood group to discuss the plan. You may also contact VTA’s Community Outreach team at community.outreach@vta.org or 408-321-7575. VTA will be holding a community meeting on Monday, February 11 at 7 p.m. the Almaden Valley Community Association at 6601 Camden Avenue in San Jose. If you can’t make the in-person meeting, a virtual meeting is scheduled for Tuesday, February 12 at 1 p.m. You can register here.